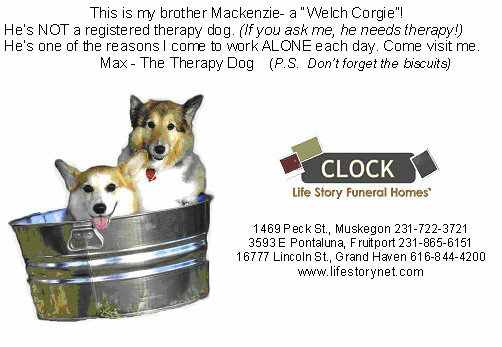 You are here: Home / Clock Funeral Home / Pets communicate! It’s true – pets do have the intelligence and ability to communicate with their owners. If you are skeptic about the ability for animals to communicate both between themselves and with humans, let me share with you that moment I stopped questioning and started believing. 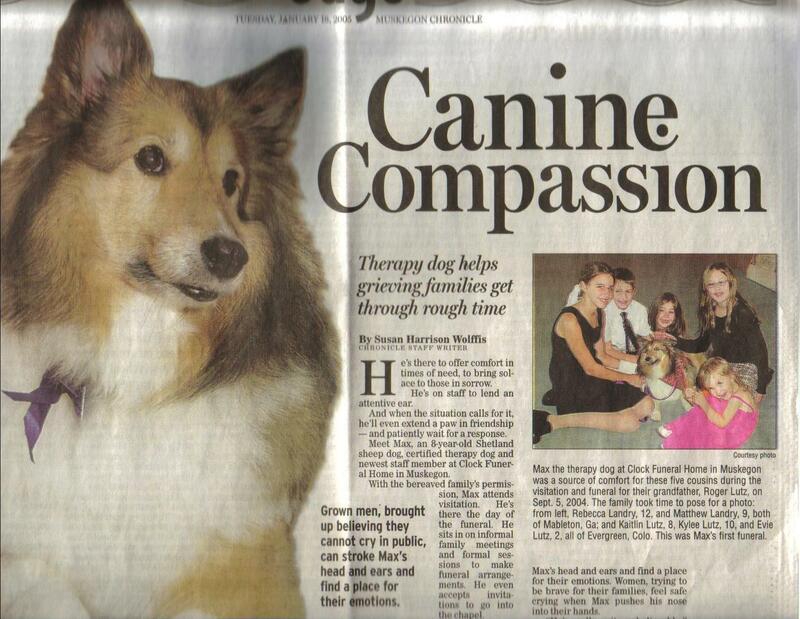 In June of 2006 our family sheltie and funeral home certified Therapy Dog Max died. Max had become somewhat of a local celebrity around Muskegon as he provided much comfort (and entertainment) to hundreds of families who were having a bad day. His name and presence was synonymous with Clock Funeral Home. In fact, when someone died and were asked which funeral home to contact, it wasn’t uncommon to hear “the one with therapy dog”. 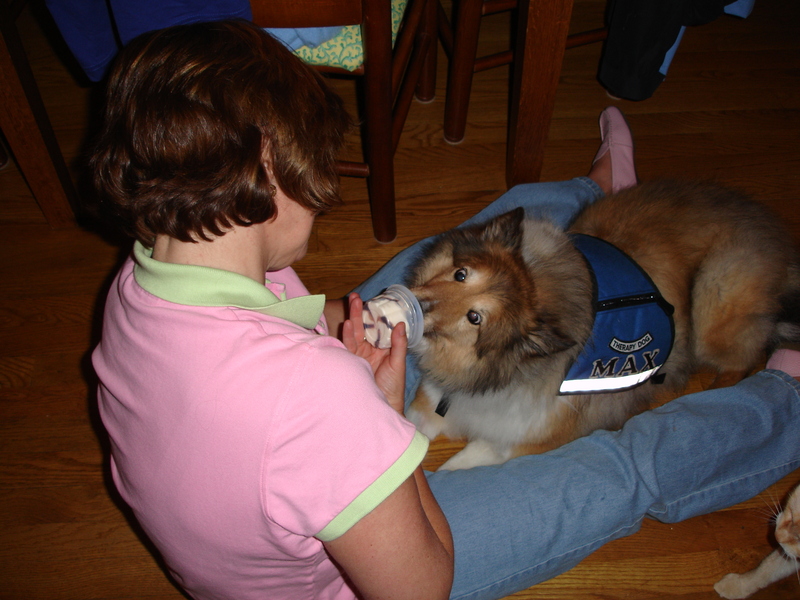 Max was seven when he became a therapy dog. He spent the majority of his days at our Muskegon location. Three years later, Max was was also being requested at our other facilities. 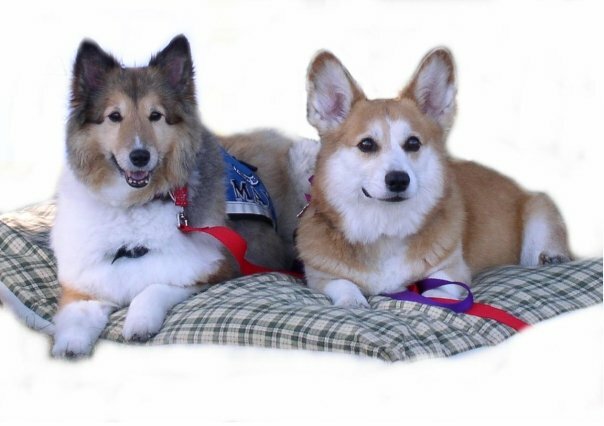 Given the fact Max was now ten, Dale and I made the decision to bring another sheltie into our family and begin to start training another therapy dog. Primarily because Max could not be two places at one time and we wanted him to assist with training, kinda teach the new dog the ropes. Much to our surprise, Max’s health declined dramatically and he went into full blown renal failure. Within one month’s time-span, Max let us know that it was time to say good-bye and we had to arrange for him to be euthanized. For those of you who have never had to make the decision to end your pet’s life, so they are no longer suffering, regardless of how much intellectual sense it makes, emotionally it’s devastating. If you have a strong bond with your pet, it’s true – they will tell you when they can no longer be strong and they are ready to cross over to the “Rainbow Bridge”. You will see it in their eyes and feel it in their spirit. People used to tell me – they will let you know; they’ll give you a sign. I used to think this was a bunch of hooey. I’m here to tell you, it’s not. Pet’s communicate with you about everything. When they are hungry, have to go potty, when they are upset and when they are dying. The difference is how the communicate. It may be through tail wags, barking, raised eyebrows, doing a dance, a nudge with their nose, not eating…you get my drift. They are no different than babies and children – they find their own language with their parent. Max let both Dale and I know. In fact, he was more calm about this decision than we were. Now that the hard decision was agreed upon, we decided to give Max one day doing what he loved best – go to work! ride and headed to work. A day of work also consisted of greeting the mailman and the federal express carrier who tipped with biscuits! This day was no different, he went to work and waited patiently till they came. He also loved long walks, so he went for a long walk around the block of the funeral home. He loved ice cream and hot dogs, his meal the night before consisted of that, as well as his breakfast. He made the rounds to say good bye to everyone and for a few hours he was spunky and full of energy. When it was mid- morning, his stamina disappeared and we had to carry him to the car. He knew where were going and was calmer than we were. Our vet clinic knew us very well and were there waiting for us. 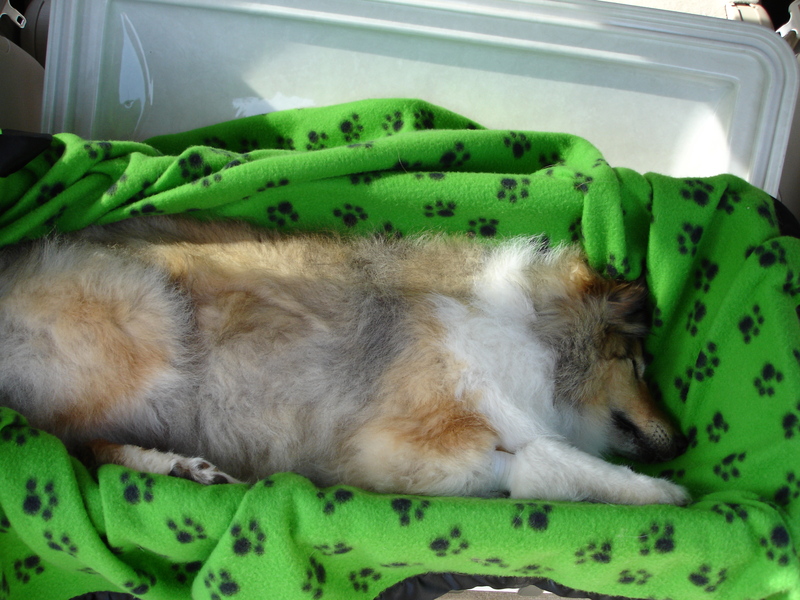 Max was sedated and if the truth be told, when it was time to euthanize, he was already gone. In an odd way – it was a beautiful thing. We had brought a casket and placed Max in it. When were arrived home, we placed the open casket on the floor so our three cats and two dogs could sniff and say good bye. Pets grieve. If they do not know what happened to their sibling (for lack of a better term), it’s not uncommon for them to act out or even become depressed. Our dogs came over and sniffed. Mac, our corgi laid on the floor next to him. Bonnie, our oldest cat was 12. She jumped up on Max, sniffed and snuggled in and slept on him for a while. (When Dale and I married, Bonnie and Max were a part of the deal. She and Max had been together a long time.) 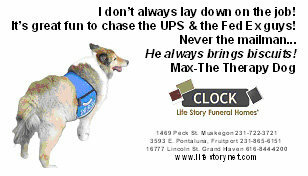 That afternoon, we took Max to a friend of mines pet crematory in Kalamazoo and had him privately cremated. When we came home our house was uncommonly quiet. Mac laid in Max’s spot by the back door and Bonnie cat laid in his dog bed. It was clear that these two were very attached to Max and were mourning their buddy. It was painfully obvious that they understood he died. I am forever grateful that I was able to provide them with the information they needed to process their sibling’s death. Simply said, death is a universal language that all animals/mammals understand. Please be mindful that just because they are feathered or four-legged they can feel and grieve. Provide a safe place and tools to do so. If you are unable to bring the deceased pet back home, take a blanket, cloth toy or article of clothing and get your pet’s scent on it. Bring the article back home and leave it out for their siblings to smell. Leave it on that pet’s bed or normal sleeping area for a day or so, so they can process what has taken place. If you have experienced this – I’d love for you to share your story with me. Some of the ads Max was in along with his front page article the Muskegon Chronicle did on him. This is a fantastic post. Pets really do communicate with us and with each other. We just have to open our hearts and minds to be able to hear them. I had to make that awful decision with Jewel in 2014. She started dropping me little hints that it was her time to go soon about two weeks before we said good-bye to her. I didn’t want to believe it was her time. But she made it more and more clear as the time got closer, and my nurse cat, Carmine, also let me know the day before Jewel passed away. I took her outside the night before so she could enjoy the grass – something she loved – and gave her her favorite foods. We read to her (she loved listening to stories) and gave her lots of love. That decision is truly the hardest thing I think I’ve ever had to do. I hope I don’t need to help another kitty to the Rainbow Bridge for a long time. Wow. What an amazing dog. His legacy lives on. We had a similar experience with our feline Charlie. She let us know it was her time and we all travelled to the clinic with her to say goodbye (My husband and I, and Charlie’s canine siblings Henry and Reese).